Meet the Gods: Fire, Ice, Water, Air & Moon delivering you the Weather as you have never experienced it before. 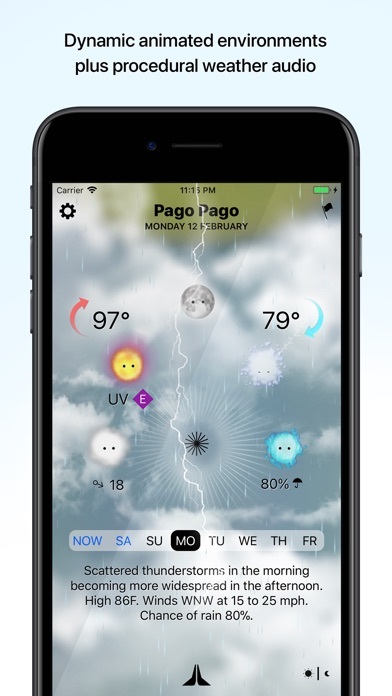 Weather Gods redefines the weather app with painstakingly crafted data visualizations, procedural graphics and audio that enable you to literally see, hear and feel the weather. 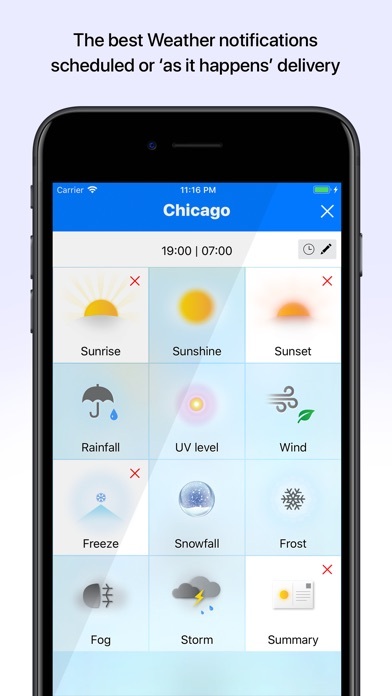 With no more weather icons to decode, the Weather Gods is simply the quickest, most engaging, most enjoyable way to get the accurate weather information you need. 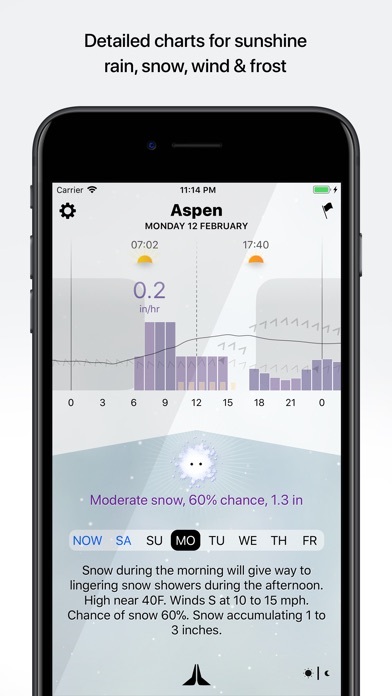 The Weather Gods skillfully integrates premium weather data into an elegant, iOS Exclusive, easy-to-use interface that will delight casual users and weather enthusiasts alike. With a wealth of rich weather data from the world’s most respected providers, the Weather Gods provide detailed site-based forecasts for over a million locations worldwide. Our advanced, next-generation notifications are easy to setup and bring you exactly the information you want right when you need it. 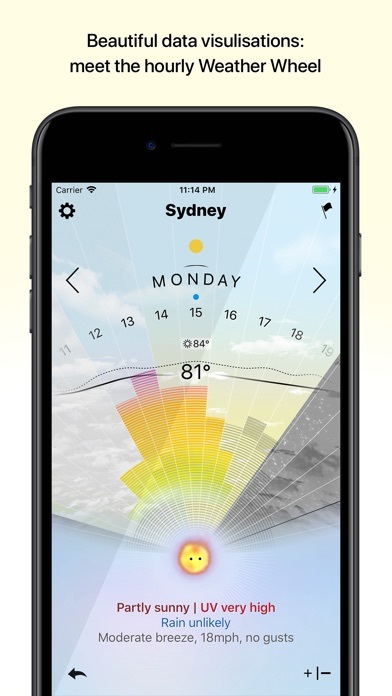 With 24 hour charts, observed weather, built in moon phase, widget, world clock and much, much more, the Weather Gods is a powerful personal time machine that lets you travel the world and visit the future. 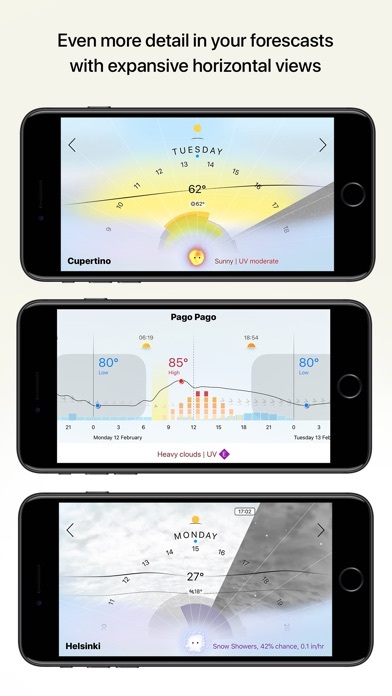 Please come join us on this exciting journey as we begin our mission to bring you the finest, most practical, most enjoyable weather app experience ever. We can’t wait to hear what you think! Features * Severe weather alerts for the US, Canada and Europe * Day & Night summary for 7 Days with animated real-time weather backgrounds * 7 Day HOURLY Forecast via the amazing ‘Weather Wheel’ * Advanced user-friendly weather notifications * Weather based procedural soundscape * Detailed 24 hour charts & hourly charting * Moon phase, rise and fall * Off-line mode for explorers & professionals * World clock & international support * Powerful accessibility support - 100% support for Voiceover * Dashboard Widget * Siri shortcuts * 3D Touch Menu * Taptic Engine support * Combining the best global weather data sources available * Over 1 million weather-accurate locations * Complimentary 32 x sticker pack Note: Continued use of GPS running in the background can dramatically decrease battery life. It’s a great app but just want to know what the red and blue arrows on the home page mean. I wish some of the icons were more explanatory. Really liking this app but the only thing it’s lacking is radar, otherwise really nice. I have been using Weather Gods since last summer and I’m finding myself relying on it a lot. I am totally blind and use it with voiceover. The accessibility is wonderful. You get it. You know exactly what to do to make weather gods accessible. Weather gods is a fun app but also a serious app. It is extremely informative and I really like using it. I highly recommend this app. It is very accurate, and very accessible. Nice graphics, big selection of info, Easy to understand, 5 day forecast. If you don’t want to look at charts & Graphs, & need a simple quick forecast. This app is for you. Satisfied.